Don’t go to Rotary next week! At least, don’t go to our regular morning meeting because we are having a social hour at Destihl on December 29th from 5:30 to 7:30 p.m. Should be fun, but mistletoe not included. Have you heard this message before? It’s the message that we are looking for members, and January 29, 2017 is a perfect time to bring a guest. Josh Whitman is our speaker, and it should be anything but boring. Remember that we used to have a three-ring binder where we could add and take out pages of our members’ bios? Not any more as CUSR is high tech. We have a members page on our website, and I will bet most of you haven’t looked at it. In fact stats show that 27 of us have never even clicked on the page. 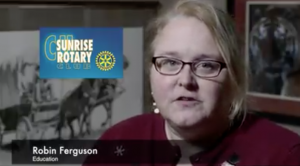 Take a moment and get to know your fellow Rotarians. In fact, you can add to your bio and upload a current picture. Want to know an interesting fact about me (Allan)? I was once salute battery commander at Fort Bliss. That was a job I got when the previous second lieutenant fired only 20 guns on a 21-gun salute. Our speaker, Mitch Davis, is the Illinois Muscular Dystrophy Association (MDA) Executive Director for all points south of I-80 in Illinois. He is originally from Tolono, and his mother had MS so he knew what it was like when he was asked to take the job with MDA. MDA was best known for the Jerry Lewis telethon although that has been discontinued. It’s an organization that has been around for 65 years and is funded without any government assistance. There are three C’s of the MDA which are Cure, Care, and Champion. As to Cure, there are currently 150 research projects underway. No cure has been found yet, but there are several which are promising to improve people’s daily life and longevity. For Care, there are 150 care centers in the U.S. of which Carle is one of them. The centers provide a multi-disciplinary approach to helping those who have multiple dystrophy. At a center, a patient will get help from dieticians, neurologists, and medical equipment among others. One of the ways that the MDA is a Champion is to provide summer camps for young people with the disease. The nearest one is the Timber Pointe Outdoor Center at Lake Bloomington in Hudson, Illinois. Mitch said this was a great experience, and our own Jeff Van Buren has been there to help kids ride Harley-Davidson motorcycles. MDA also has a loan closet with various types of equipment available. Muscular dystrophy is a progressive disease so different equipment may be needed for assistance at different times. Items would include lifts, scooters, and other accessories. Mitch noted that the University of Illinois has always been one of the most advanced schools in the country to help people with disabilities. Mitch encouraged people to get involved by volunteering through one of their many different outlets. 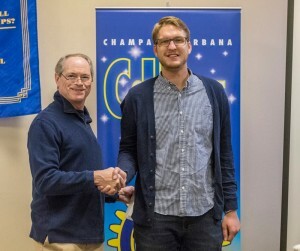 He noted their logo and website were relaunched earlier this year so it is probably a good idea to check out their webpage (https://www.mda.org/office/champaign). If you are interesting in talking with Mitch Davis you can reach him at (217) 351-1853 (office) or (217) 841-1269 (mobile) or mdavis@mdausa.org. President Rod inducted new member Michelle Barbey and welcomed prospective member Angie Schoonover, Principal at Edison Middle School. There will be no morning meeting on December 29. Please bring a guest to a social at Destihl between 5:30 and 7:30 PM. It will be a great opportunity to introduce and meet prospective members. Please also invite guests to the January 26 meeting, when AD Josh Whitman will be our speaker. Get your Foundation Bowl picks to Paul Conforti. 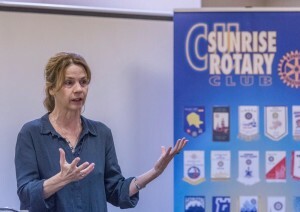 Laura introduced Isak Griffiths, Executive Director of The Courage Connection. She is a U of I graduate and a former Oracle data base coordinator with the US Air Force. The mission of The Courage Connection is to empower women to make decisions that will have lasting impact on their lives. They run transitional housing for homeless women, 6 units of affordable housing and the resale shop at Lincoln Square. Domestic violence is the single biggest reason for women’s homelessness. Many are homeless following release from prison. Most women incarcerated for violent crimes are there for retaliation for abuse. Illinois was the first state in the nation that made domestic violence a crime and ours is the oldest battered women’s shelter in the US. Isak said that CU wages are lower but rents are higher than in Chicago. So people getting out of prison and going into minimum wage jobs can’t afford to live. Oftentimes they end up back in prison. The shop at Lincoln Square provides work opportunities as well as professional clothing for the clients. You can drop off clothing donations on Tuesdays, Thursdays and Saturdays. Monetary donations can be made on line at www.courageconnection.org. Adam Wright was introduced as a new member to our club. Adam is a commodity broker with Powerline Group in Savoy. He is married, and his wife teaches in the Urbana Schools. Welcome Adam! Thanks to Robb and his helper elves for putting together another successful fruit sale. We sold around 500 cases. This is really the only time of the year when we replenish our charitable foundation so we depend on Sunrisers to help. In the past, many of those who did not participate in the fruit sale made generous cash contributions. 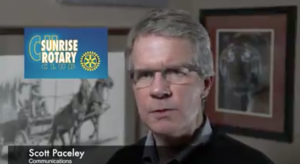 Darrell is looking for video testimonials for CUSR to put on Facebook to promote our club. Have you thought of a new member to join our club? 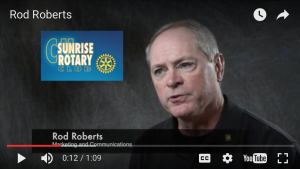 It is an honor to be a Rotarian, and Rotary stands for “Service Above Self.” If you are a Rotarian it is a statement about what kind of person you are, and many just need to be asked. Carrying on with the service theme, check out Lou’s email asking for volunteers for Eastern Illinois Food Bank distribution in January. So you don’t have a black tie dinner party on New Year’s Eve? How about attending our social at Destihl on December 29th from 5:30 to 7:30 p.m.? Should be fun, but mistletoe not included. Janice Jayes, Ph.D., taught politics and history at Al Akhawayn in Morocco in 2008-2009 before moving to Champaign. She teaches Middle Eastern History at Illinois State University. She earned her Ph.D. in History (with a specialization in U.S. foreign relations) from The American University, and her M.S. in International Relations from Georgetown University’s School of Foreign Service. Dr. Jayes discussed the increased role of Islam in politics which took off in 1973 when OPEC was organized so members could use their leverage to set world oil prices and output to stabilize their income. Middle Eastern countries, and their royal families, became extremely rich due to these oil profits. These royal families established their own political security through religious control. Similarly, terrorist organizations have used this tactic to recruit new members. Dr. Jayes noted events such as the 1979 Iran Revolution, the 1991 Iraq Highway of Death, the 9/11 disaster, the Iraq invasion by the Allies, the Abu Ghraib Prison scandal, and the U.S. involvement in Afghanistan have all contributed to strong anti-U.S. attitudes in the Mideast. Two organizations who have prominently used religion for political ends include Al Qaeda, as personified by Osama Bin Laden, and its successor ISIL which stands for “Islamic State of Iraq and the Levant” meaning the whole eastern shore of the Mediterranean. These organizations no longer needed a government backer that was an official state because they have expertly used technology. In the case of Al Qaeda, it flourished through the Internet and the abundance of arms flowing through the Mideast. It became a centralized organization, but its successor, ISIL, became decentralized and uses cell phones to organize and communicate with its followers as well as to transfer money around the world. ISIL operates in separate groups which take independent actions and is more difficult to fight. Unfortunately, the U.S. has developed no winning strategy against ISIL. While we can use drone strikes to kill various players, others readily take their place. Furthermore, the collateral damage that often results from such strikes results in strong negative sentiments towards the U.S. Borders in the Middle East are coming apart, and we are now a big, militarized nation that has difficulty to fight this new type of terrorist organization. 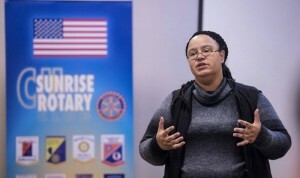 On December 8th, Janice Jayes, Instructional Assistant Professor, Illinois State University, gave us thoughtful background on ISIS and other factors in world issues. 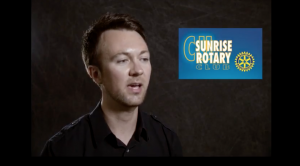 On December 8, C-U Sunrise Rotary welcomes Adam Wright as our newest member to the club.